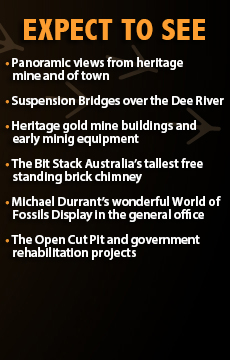 Take a fascinating journey into Australia's amazing gold mining history and delve into its prehistoric past. 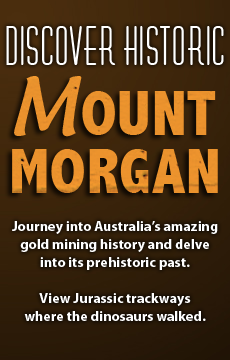 Mount Morgan Guided TMC Tours takes you through historic Mount Morgan, into the famous heritage listed gold mine. 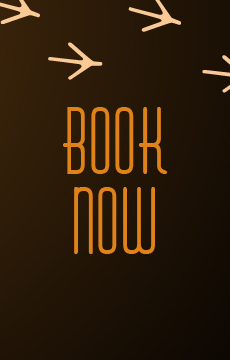 In addition you will also get to view dinosaur footprints found in Mount Morgan, and viewed at the Michael Durant fossil display. Once one of the world’s richest gold mines for its first ten years of operation. Once boasted one of the busiest bustling towns in Queensland at its peak in the early 1900's. Home to the best examples of early Jurassic dinosaur track way prints in Australia. Yesterday’s mining traditions. Today’s environmental challenges. One town- so much to discover! Experience Mount Morgan with TMC Guided Tours today.